Trail Design Meetings Scheduled in Revere, Saugus and Lynn – Bike to the Sea, Inc.
Public meetings on design work for the Northern Strand Community Trail are scheduled in Revere, Saugus and Lynn. The public is encouraged to come and share ideas on how to make improvements to the trail. In February the state announced it would award $1.5 million for design work, which includes design improvements for sections of the trail already open, as well as the long sought extension through Lynn. The funding will also be used to extend it in Everett through the Wynn Casino property where it will eventually connect to trails heading into Boston. The meetings are being billed as “listening sessions” where city and state officials and members of the landscape/architect company, Brown, Richardson and Rowe, will hear from residents about their ideas on improving street crossings; creating wayfinding signs; and providing landscape amenities and seating. Revere: June 7, 6 p.m., at the Quality Inn Community Room, 100 Morris St., Revere, Mass. Lynn: June 12, 6 p.m., at Lynn City Hall, Lynn Auditorium, 3 City Hall Square, Lynn, Mass. Saugus: June 21, 7 p.m., at Town Hall, 298 Central St., Saugus, Mass. 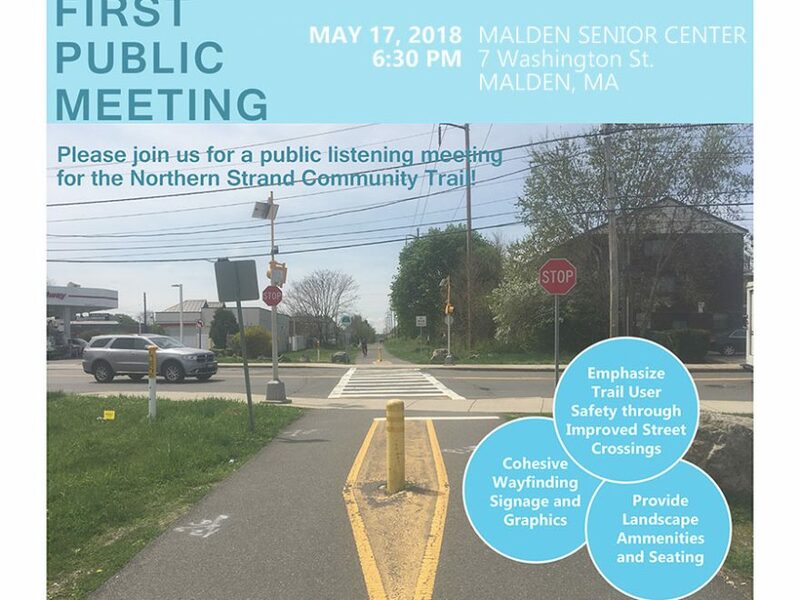 The first public meeting on design work for the Northern Strand Community Trail was held on Thursday, May 17 at 6:30 p.m. at the Malden Senior Center, 7 Washington St. in Malden. For more information, contact Yem Lip at ylip@cityofmalden.org; 781-397-7040.